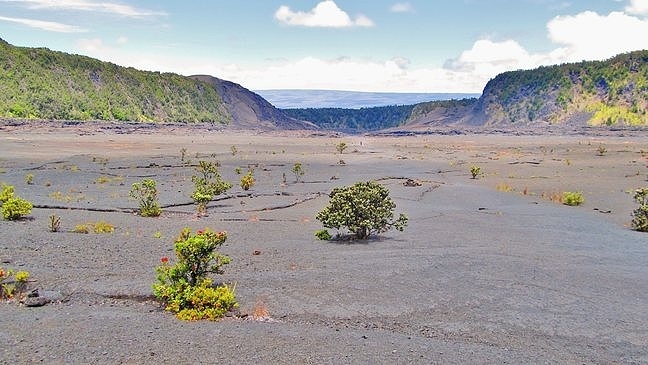 The Kilauea Iki trail is hard to beat for superb hiking in Hawaii Volcanoes National Park. There are abundant hiking opportunities in the Park but this is our favorite. At just under four miles (6.5 kilometers), the loop is a fun and delightfully scenic Hawaii hike, a great way to spend part of the day. 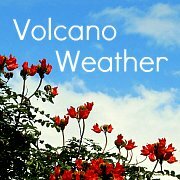 Still simmering after more than 50 years, Kilauea Iki (little Kilauea) today belies the ferocity of the Kilauea Volcano eruption between November 14 and December 20, 1959. Over that 5-week period spectacular fountains of lava exploded skyward and rivers of lava poured into the crater. The depth of the lava lake rose dramatically, rising nearly 100 meters (328 feet) over a 5 day period. At one point lava was entering the crater through the lava vent at a rate of 1.45 million cubic meters per hour, or more than 380 million gallons/hour! 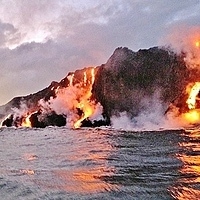 Waves of lava could actually be seen breaking against the shore of the crater. Today, a dry lava lake with numerous steam vents spouting from deep beneath the surface is all that remains of that violent eruption. And it makes for a fantastic hike! Spectacular any time of day, we like to start early when the day is cool and take our time, perhaps stopping to enjoy lunch along the way. Your starting point is the Kilauea Iki Overlook, south on Crater Rim Drive just past the Park entrance. As you stand at the overlook peering down, try to imagine what the dry lava lake that spreads out in the valley below must have looked like when it was full of oozing volcanic magma. Looking west, the obvious plume of smoke from Halema'uma'u crater inside the Kilauea caldera is visible. In the distance Mauna Loa volcano towers above it all. We find it more enjoyable to start the hike on the right side of the overlook. 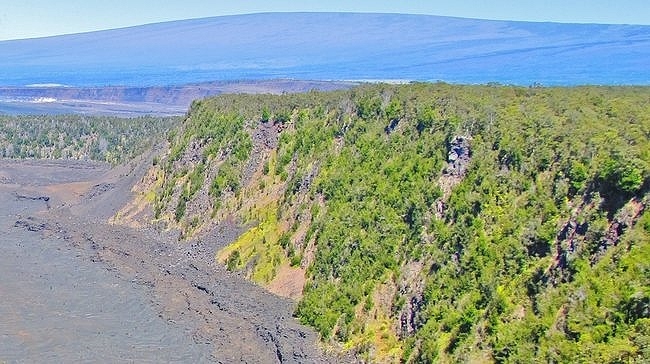 For about the first mile, the trail starts off in a steep descent along the north side of the Kilauea Iki Crater, before becoming a gradual slope through thick, lush rainforest. The sweet smell of tropical plants and flowers permeates the forest, and placards along the way describe what you are seeing. Take your time, and stop from time to time to listen to the soft sounds of the forest, with birds chirping and the breeze rustling the tree tops. As you approach the western edge of the crater, the trail again descends steeply as you drop to the crater floor. As you exit the rainforest, you emerge onto the surface of the crater. You are standing atop an ancient lava lake! Keep an eye out for the interesting steam vents as you make your way across the crater. While the lake may seem quiet on the surface, there is still plenty of activity emanating from the depths. 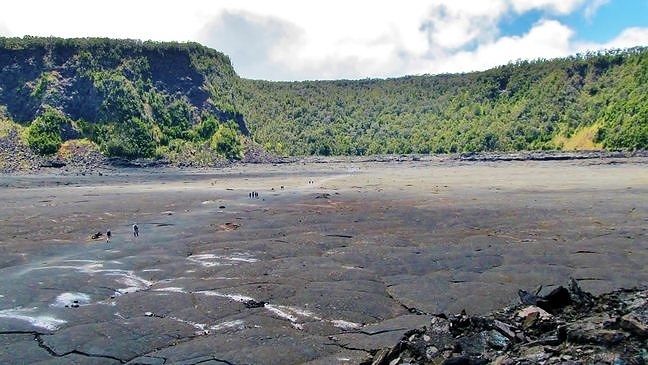 Consider as you cross the bottom of the crater that it was filled with a river of lava little more than 50 years ago. It's surreal. At the far eastern edge of the crater, we enjoy taking a break on the rocks before beginning the final ascent back to the top. It’s a nice place to gaze back across the lava lake, with the summit of Mauna Loa filling the skyline. At this point the trail again enters the cool of the rainforest canopy for a gradual one-half mile climb to the top. The trail exits the forest at the parking area for Thurston Lava Tube. Your starting point and the crater overlook are another half mile northwest.